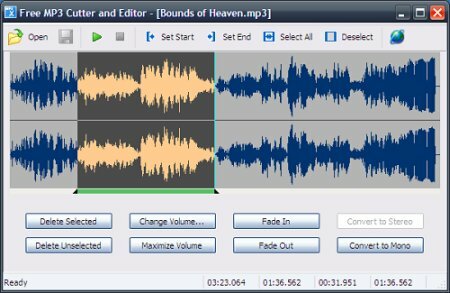 This is an extremely simple and handy Windows software for editing mp3 files. Click to open an MP3 file for editing. The waveform graph and editing command buttons are then displayed. Define a selection, if needed, for the editing commands. Just click on the graph to set the current position for playback, then click toolbar button or to set this position as start or end of selection. You can also click and drag on the graph to define the selection area directly. Click any of the command buttons below the graph. See the Editing Commands section below for short descriptions of the available commands. Click to save all changes made to the document. You can choose a new location for the file when it is being saved for the first time. Delete Selected	- Deletes selected part from the mp3 document. Delete Unselected - Deletes unselected part from the mp3 document. Change Volume - Changes audio volume by specifying a percentage value. Maximize Volume - Increases volume as high as possible without distortion. Fade In - Gradually increases the volume throughout the selection. Fade Out - Gradually decreases the volume throughout the selection. Convert to Stereo - Duplicates mono track to make a stereo track. Convert to Mono - Mixes all channels to make a mono track.